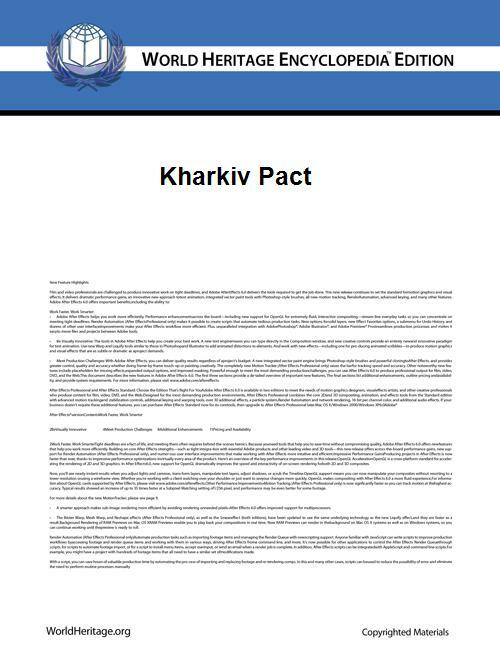 The Agreement between Ukraine and Russia on the Black Sea Fleet in Ukraine, widely referred to as the Kharkiv Pact (Ukrainian: Харківський пакт) or Kharkiv Accords (Russian: Харьковские соглашения), was a treaty between Ukraine and Russia whereby the Russian lease on naval facilities in Crimea was extended beyond 2017 until 2042, with an additional five year renewal option in exchange for a multiyear discounted contract to provide Ukraine with Russian natural gas. The agreement, signed on 21 April 2010 in Kharkiv, Ukraine, by Ukrainian President Viktor Yanukovych and Russian President Dimitry Medvedev and ratified by the parliaments of the two countries on 27 April 2010, aroused much controversy in Ukraine. The treaty was a continuation of a treaty signed in 1997 between the two nations. Shortly after the (disputed) March 2014 accession of Crimea to the Russian Federation, Russia unilateral terminated the treaty on 31 March 2014. In 1997, Russia and Ukraine signed the Partition Treaty, establishing two independent national fleets and dividing armaments and bases between them. Ukraine also agreed to lease major parts of its new bases in Sevastopol to the Russian Black Sea Fleet until 2017. During the presidency of Victor Yushchenko the Ukrainian government declared that the lease will not be extended and that the fleet will have to leave Sevastopol by 2017. Amid several Russia–Ukraine gas disputes, including a halt of natural gas supplies to European countries, the price that Ukraine had to pay for Russian natural gas was raised in 2006 and in 2009. The Prime Minister of Ukraine, Mykola Azarov, and the Energy Minister, Yuriy Boyko, were in Moscow in late March 2010 to negotiate lower gas prices; neither clearly explained what Ukraine was prepared to offer in return. Following these talks Russian Prime Minister Vladimir Putin stated that Russia was prepared to discuss the revision of the price for natural gas it sells to Ukraine. Mid-April Ukrainian officials stated they are seeking an average price of $240–$260 per 1000 cubic metres for 2010. Ukraine paid an average of $305 in the first quarter of 2010 and $330 in the second quarter. On 21 April 2010, Russian President Dmitry Medvedev and Ukrainian President Viktor Yanukovych signed an agreement in which Russia agreed to a 30% drop in the price of natural gas sold to Ukraine. Russia agreed to this in exchange for permission to extend Russia's lease of a major naval base in the Ukrainian Black Sea port of Sevastopol for an additional 25 years (to 2042) with an additional 5 year renewal option (to 2047). The agreement put a cap on the scale of price hikes; but the main unfavourable terms for Ukraine of the 2009 gas contract remained in place. "We have indeed reached an unprecedented agreement," the Russian president stated. "The rent [for the naval base] will be increased by an amount equivalent to that of the [gas price] discount." The agreement was subject to approval by both the Russian and Ukrainian parliaments. Both parliaments did ratify the agreement on 27 April 2010. The Ukrainian parliament ratified it after several eggs were thrown towards the speaker, Volodymyr Lytvyn, by deputies and other incidents. At 10:40, while most of deputies were out of their seats, the voting screen showed the number 236. During the voting, half of deputies of Party of Regions (PR) were out of their seats blocking the podium. For the ratification were 160 members of PR, including Rinat Akhmetov, who was not present in the session hall. Among the opposition parties, the ratification was approved by nine members of BYuT and seven from Our Ukraine. All members to the last from the Communist Party of Ukraine and Lytvyn Bloc voted for the Kharkiv Pact as well. Of those who did not belong to a faction, only Taras Chornovil, Oleksandr Fomin, and Ihor Rybakov did not support the agreement. On 28 March 2014, amidst the 2014 Crimean crisis and one week after the (disputed) accession of Crimea to the Russian Federation Russian President Vladimir Putin submitted proposals to the State Duma on terminating the legal effect of number of Russia-Ukraine agreements including denouncing the 2010 Kharkiv Pact treaty and the Partition Treaty on the Status and Conditions of the Black Sea Fleet. The State Duma approved the denunciation of these Russian-Ukrainian agreements unanimously by 433 members of parliament on 31 March 2014. Taras Kuzio criticized the treaty, stating that it was railroaded through parliament without parliamentary or public discussion and after ignoring votes against it in three important committees (two of which had negative majorities). He argued that the treaty violates the constitution, which bans permanent military bases, and that it was not discussed prior to a vote in the National Security and Defense Council as the constitution requires. He said that the treaty is illegitimate because it rests on only 220 deputies from three factions; Kuzio argued that the remaining twenty-five deputies had been blackmailed, bribed or coerced to defect from the opposition. He added that Ukrainian public support was "gained by a lie" that the deal would bring cheaper Russian gas; while in fact, a new July 2010 agreement with the IMF mandated Ukraine to increase utility prices by a staggering fifty percent on 1 August 2010, and another fifty percent in April 2011. According to former Ukrainian Prime Minister Yulia Tymoshenko the agreement violates part of the Ukrainian Constitution, which forbids the country from hosting foreign military bases after 2017. The Chairman of the Ukrainian Constitutional Court said on 23 April that only the President and the Cabinet of Ministers can request a court ruling on constitutionality. Our Ukraine called for the impeachment of President Yanukovych for violating the Ukrainian Constitution. Opposition members in Ukraine and Russia expressed doubts that the agreement would be fulfilled by Ukraine's side. According to Yanukovych the only way out of holding the state budget deficit down, as requested by the International Monetary Fund, while protecting pensioners and minimal wages, was to extend the Russian Navy lease in Crimea in exchange for cheaper natural gas. Opposition members in Ukraine described the agreement as a "sell out of national interests". Prime Minister Putin opined that the price Russia was asked to pay was exorbitant and remarked, "No military base in the world is worth that much money. We could build several such bases for that amount." ^ "Ukrainian sovereignty withstands Medvedev". Kyiv Post. 20 May 2010. Retrieved 11 June 2010. ^ "Харківський пакт" не гарантує, що з ЧФ РФ не буде проблем (in Ukrainian). ^ "Ukraine wants Russia, EU to invest in its gas transportation system". ^ Большинство украинцев поддерживают Харьковские соглашения (in Russian). Segodnya.Ua. 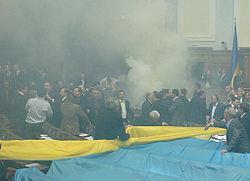 2 June 2010. Archived from the original on 5 June 2010. Retrieved 11 June 2010. ^ Янукович коснулся истории (in Russian). ^ Russian billions to save Ukraine, RIA Novosti, 29 April 2010. ^ Boris Nemtsov – Russia Needs Black See Fleet in Crimea for War Against Georgia, Georgian Times, 30 April 2010. In summer of 2014, the General Prosecutor of Ukraine opened a criminal case against Viktor Yanukovych on several charges. The treaty allows for Russia to station a limited number of troops in Crimea, 25,000 maximum. In August 2011, Ukrainian Prime Minister Mykola Azarov stated that Ukraine seeks to reduce imports of Russian natural gas by two-thirds (compared with 2010) by 2016. In June 2010, Ukraine paid Gazprom around $234 per 1,000 cubic metres. However, Ukrainian consumers experienced a 50% increase on household natural gas utility prices in July 2010 (a key demand of the International Monetary Fund in exchange of a $15 billion loan). Payments have since increased annually: in August 2011, Ukraine paid Russia $350 per 1,000 cubic metres; in November 2011, it paid $400 per 1,000 cubic meters; and in January 2013, Ukraine paid $430 per 1,000 cubic metres.